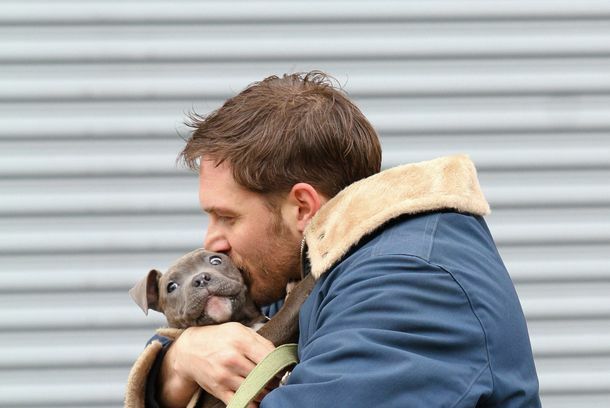 No one changes the timbre, the inflection, the quaking gurgle in his voice the way Tom Hardy does. Earlier this week, the trailer for The Drop, a new Dennis Lehane–penned crime film arrived. The Drop is notable as it features one of James Gandolfini’s final performances. It also features an increasingly oppressive sound — Tom Hardy trying on a cartoonishly affected and yet weirdly enchanting accent. The Drop is a New York tale of dirty money and the schnooks who hold it for the mob. This makes Hardy a Brooklyn yokel with a criminal concern and a voice like a cartoon cat. “They cawl it a drawp bahr — you just hide the entyah city’s dirty munny in plain sight,” he murmurs in the trailer’s voice-over. This Brooklynese — rendered by a sullen man enduring the pain of perfectly sheared stubble — originated with Ryan Gosling in Drive, as he attempted to shake all manner of Canadian birthing and Disney rearing from his voice. It’s what foreigners (wrongly) identify as city grit. In Gangster Squad, Gosling took it to comic heights. Hardy’s going for the same, but less woozy and more wounded. Instead of a scorpion, his satin jacket might have a slug on the back. Hardy does this all the time. No one changes the timbre, the inflection, the quaking gurgle in his voice the way Hardy does. Born in London’s Hammersmith borough, he seems like an actor who gets bored easily. Every role is a new opportunity to try a little personal stunt. He’s been a scuzzy American city-dweller before. In 2011’s Warrior, he was a Pittsburgh punk, a sewer rat with a thick neck and a bad attitude. He talks slower and his jaw goes slack more often. He’s not sad, really — just pissed off. He sounds like he’s punch-drunk, and also drunk-drunk. A year later, he was Bane in The Dark Knight Rises, owner of the weirdest sinister dandy voice in movie history. By now we know that Bane was raised in a hole-prison — this does not explain why he speaks like Rex Harrison on whippets. There is literally no voice from this century that is more fun to imitate than Hardy’s Bane. That fanciful refinement seems closer to Hardy’s natural speaking voice. But the more elegant he gets, the more perilous the voice becomes. In his art-house breakthrough, Bronson, he was magisterial, an elegant maniac. Like the real-life Charles Bronson, he was a showman with concrete hands, a twirled mustache, and the stiffness of the Queen’s Guard standing outside Buckingham Palace. In Inception, where most of us first encountered Hardy, he was a dashing forger, purring like a panther. He was himself, but smoother. There’s a reason he’s the most memorable thing in that movie not counting the buildings that fold in on themselves. His supple drawl imprints on your mind. When he inches closer to his London ’burbs origins, as in the abominable farce This Means War, he seems to be the Real Hardy. It’s his worst movie, and he’s never been less interesting. He shouldn’t do romance and he shouldn’t play close to self. In 2012’s Lawless he was a hayseed thug with marbles in his mouth, pomade in his hair, and moonshine in his guts. Nobody plays dumb-smart like Hardy. In the drama Locke, out later this month, Hardy plays Ivan, a concrete-pouring manager on a one-night journey to the bottom of his own life. Throughout, Ivan has a head cold and also appears to have some Russian heritage and so Hardy, who spends literally the entire movie in a car talking on the phone, adopts an exacting and exasperated tone: like a philosophy professor who can’t seem to get his class to understand Voltaire. (Edit: This may very well be a Welsh accent.) It is a truly strange and compelling choice. Every time he blows his nose you think his head might explode. Yesterday, news broke that Hardy will star in a Ridley Scott–produced BBC series called Taboo. Here’s the synopsis: “Set in 1813, the story follows James Keziah Delaney (Hardy), a rogue adventurer who returns from Africa with 14 ill-gotten diamonds to seek vengeance after the death of his father.” Nineteenth-century rogue adventurer! Think of the possibilities. He already appears to have found his inspiration.